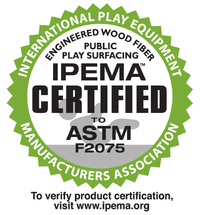 When we are installing playground chips we use a certified product called “Engineered Wood Fiber”. 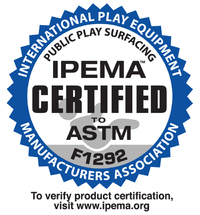 The product is tested and IPEMA certified. Don’t be fooled by other non-certified products. For all our playgrounds we recommend having at least 6” minimum depth of safety surface around your play area. This is mandatory in the fall zones. We use "Soft one" made by Pallet one. We can fill your playground boxes with fine white quartz sand. The white sand will not stain clothes unlike yellow masonry sand and does not contain any rocks or course particles that are abrasive to tender hands. After years and years of weather conditions and compaction, the safety surface material begins to decompose as all organic material will. This causes the safety surface to lose its ability to absorb the fall of the children, leading to a greater risk of injury. Eventually topping off the safety surface is not enough. A dig out should be done every 4-7 years. This will depend on your site conditions. Decomposition of the material in the playground is increased in playgrounds with poor drainage. If water sits in your playground for any amount of time after it rains call us for a consultation immediately. We have solutions for poor drainage. A “dig out” can be done during the winter as long as there is no snow on the ground allowing us to refurbish the playground at a time when play is limited. A sure sign that it is time to rejuvenate your safety surface through a dig out is if you can dig down 3 inches or less and find the chips have broken down into soil and no longer look like installed chips. Please understand as long as you can maintain a minimum of six inches of chips by adding playground mulch your safety surface is okay. Typically when we perform a dig out we remove six to twelve inches of material. This material is removed and disposed of properly at a landfill that recycles wood products. We can at this time install a drainage system in your playground if water is a problem. Often we replace playground borders as well. We recommend plastic ties as they are impervious to rot although we will install wood timbers if you wish. A soil barrier is normally installed to prevent the playground mulch from making contact with the soil. This helps slow the breakdown of the mulch in the future. The playground is then restored with a new safety surface and you are back in business knowing you have done the best you can at this time to make the children safe. Typically this work takes between three to five days to perform. We will work over the weekend to minimize closure time on the playground. Keeping your playground areas in optimal conditions will help keep the kids safe. We carry two types of playground borders. They are the traditional wood border which is a ground contact treated 6x6 or 4x4 timber. Timbers are the most cost effective border. They can be cut in any size to accommodate any dimension. The biggest problem with a timber border is that over time it may rot and splinters are always a possibility. The second playground border we carry is manufactured out of plastic. The borders come in both eight and twelve inch heights and are produced in four and six foot lengths. The borders are made in five colors. They are black, green, red, yellow and blue. We also offer fake rock and stone timbers that come in segments which are eight inches high and four feet long. Plastic borders are the best choice for long term playground border solutions. They are impervious to rot and will not splinter and have no sharp edges. Rubber playground chips can be the right product for you under the right circumstances. We provide rubber mulch in the following colors, cedar red, turf green, black onyx, ocean blue, southern cypress, mocha brown and natural black. They are a higher cost, but can be cost effective when they are placed in the right area. Here are a few things that you will want to take into consideration when comparing Rubber Chips vs. Engineered Wood Fiber. The leaves will mix with the rubber mulch creating a slimy mess after several years. The amount of use the play area will get. Rubber chips will get disbursed over a large area. Maintenance of the over spill into other areas. We can give you recommendations as to what will work the best for you. If you are finding that your safety surface is starting to wear down and is not at the levels that it should be you are probably ready for a top off. A play area is topped off, by adding additional material on top of your existing play surface. Normally it is recommended to add an additional three to four inches of material at least once a year. High traffic playgrounds may require two top offs a year. This should maintain an adequate safety surface and will often extend the life of a safety surface beyond normal limits. Ever have trouble getting to those hard to reach sites with a skid steer? Do you need to get to the next job faster? Have you been in a time crunch to get the safety surface installed? Don’t have a place to dump the material so that it can get installed? We make those kinds of problems go away! We deal with many playground installers, so we know what problems can arise on your jobs. Time is money and we save you a lot of both. Don’t get your playground shut down by licensing for not having enough material or the correct type of material in your play areas. We recommend doing a “top off” every 12 months. The correct amount of safety surface on your playgrounds will reduce the risk of a child being hurt. Do you have a playground at home? Have you ever wondered how you can get the same material you see at your child’s school or at the county park? We actually are a company who installs those playground chips. Whether it is just a simple new layer of playground chips or construction of a new playground we are the right company for the job. Parks & Recreation clients have reduce overall yearly budgets for maintaining the safety surface on their playgrounds by hiring Mulch Solutions. Our blower truck fleet is fast and efficient. Cost savings of fifty percent or more are possible when the parks department no longer has to coordinate the purchase and storage of material and then allocate the equipment and manpower to install the material in a labor intensive manner in the play ground areas without the proper tools.